Following in the footsteps of the social-media-driven Emma Watson Book Club—and hopefully not in those of the defunct Kelly Ripa Book Club—the Andrew Luck Book Club launched this week, causing lots of people to marvel that “this is a real thing!” Yes, the Colts quarterback really is behind this, building on his reputation as the “NFL’s unofficial librarian” to promote reading among his fans, starting with The Boys in the Boat, a nonfiction best-seller about an underdog American rowing team that competed in the 1936 Olympics. The author, Daniel James Brown (not The Da Vinci Code author—different Dan Brown), spoke to us about this latest chapter of the book’s success. How did you hear about Andrew Luck selecting The Boys in the Boat as the first selection for his book club? I believe I first heard about it through my publicist at Viking/Penguin, but within hours of the announcement, people were sending me messages on Facebook telling me about it. I was thrilled, of course. 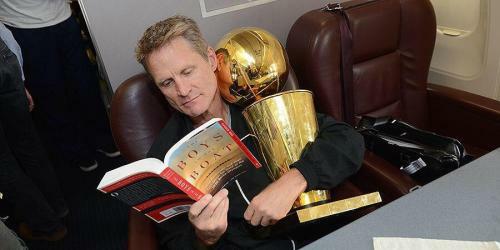 It reminds me of last year when Steve Kerr, head coach of the Golden State Warriors, posed holding a copy of The Boys in the Boat in one hand and the championship trophy in anther, just after winning the NBA title. It’s always great when celebrities endorse your book, but because this book is so much about team-building, it’s especially nice when superstar athletes and coaches endorse it. Do you know who Andrew Luck is? Are you a football fan? Oh, certainly, I know who Andrew Luck is. I am indeed a football fan, and Luck’s had a pretty spectacular career so far, so it would be hard not to take note. I have huge admiration for him, not only for his skill as a quarterback but also for the fact that he promotes books and literacy as he does. You taught at Stanford, where Luck played college ball. Yes, though I’m afraid that was before Luck was even born! I first became aware of him when he was playing for Stanford, mostly because he was busy making those of us who are Cal Berkeley fans miserable. As you may know, the Cal–Stanford rivalry is one of the oldest collegiate rivalries, so I’m always keeping my eyes on who is playing at Stanford. And then of course his record at Indianapolis has been pretty remarkable, so again it would be hard not to be interested in him. Does it ever surprise you to learn who’s reading your book, the reach of a book, whether it’s a celebrity or someone from a very different walk of life than you imagine your typical reader to be? It does. One of the remarkable things about this book is the range of people that it speaks to. So, for instance, among political figures, people as diverse as Mitt Romney and Harry Reid have embraced it. More generally, the people that show up for my book events range from 8 to 80. I get rowers and moms and bankers in three-piece suits—all of them equally passionate about the lessons the book offers as well as the entertainment value of the story. It really seems to appeal to a very wide spectrum of readers. Much of what I read these days is “the competition.” So I read everything that certain narrative nonfiction writers come out with—people like Laura Hillenbrand, Hampton Sides, Erik Larson, David Laskin, and Timothy Egan. I admire all of them very much, and so I not only look forward to reading their work for pleasure, I also like to see where they are taking the craft of producing this kind of book. When it comes to fiction, I often seek the advice of my wife, who has a very discerning eye. She recently prompted me to read Anthony Doerr’s All the Light We Cannot See, one of the best novels I have read in many, many years. Andrew Luck received The Boys in the Boat as a gift. Does anyone ever give you a book as a present? I imagine it would be intimidating to gift a best-selling author with a novel. I do have friends who send me books, and they know better than to be intimidated by my recent success. If anything, I think they enjoy challenging me to see whether I can recognize what they see in their favorites. The fact is, though, that I often can’t get to books that friends recommend. On top of their recommendations, I am inundated with books and manuscripts from people seeking blurbs for their dust jackets. I have time to read only a very few of them, perhaps two or three a year. With all that said, though, I’m always scanning book reviews and watching what’s popular at my local bookstore or on the online bookstores, just to make sure I don’t miss something really great. Can you immerse yourself in another book without detaching from the previous one? I’m struggling with that right now, actually. It really is hard to engage a new topic when you are spending so much of your time talking and thinking about your current book. I’m still very, very engaged with the characters in this book and with the story generally, so it is hard to get traction on a new topic. My books are very research-intensive, so they take several years at a minimum to develop, and I want to make sure that whatever I take on next is something that will hold my interest through the whole process. Because I write nonfiction, I have to find a story somewhere out in the world that has all the elements that make for a good read, that hasn’t been written by someone else, and that is supported by adequate documentation. It’s a challenge.